If you're a salmon spin fisher and think that salmon are just taking short when they continually drop off then you're kidding yourself on and will continue to squander hooking opportunities while spinning. Most of the time that happens is because the spinning reel clutch is far too loosely set. Don't think the big hook on a 30 gram Toby 'Salmo' is going to set itself when the salmon grabs it and pulls against an overly slack clutch. If you do then I've some bad news for you and I've watched this for so many years and even with ghillies who've continually dropped hooking opportunities whether 'harling' or allowing their guest to spin with lightly set spinning reel clutches. All hooks logically require sufficient pressure to be set and if they are not set fairly quickly while spinning you're guaranteed to get your lure back minus the fish! The majority of the inside of a salmon's mouth is fairly tough tissue therefore those bigger spinning lure hooks are not going home properly unless a good firm bend on the rod is administered where that vital 'hook set' energy is not negated by the sound of a light clutch setting. Tightening your clutch up to set the hook should make perfect sense and then once you know that salmon hook hold has been properly achieved then loosen the clutch slightly to play the fish. You want the clutch setting not full on but not far away where line can be pulled off the reel spool but only with a reasonably strong pull. I've seen it so often on the River Tay where great salmon hooking opportunities were missed by anglers who repeatedly loosened off their clutches even after being properly briefed. Personally I get frustrated when anglers turn up on a beat and don't listen to the Head Ghillie's instructions as professional 'time on the river' and river observation experience would suggest the angler should be listening. 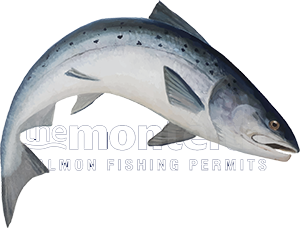 Any big salmon hook needs set properly and any thoughts of a salmon taking off like a bonefish on an instant powerful & unstoppable 100 yard run when hooked are not relevant to salmon fishing as there's always time to set the hook then loosen off before the fun & games of battle commences. Atlantic salmon fishing in Scotland is one of these rural pursuits where anyone can just buy the equipment & a permit and go out there which is great however there needs to be a good understanding & ability for true fishing day value to be achieved so any logical tactical assistance should in my opinion be grasped & appreciated by any angler who's given these little gem snippets of information that can assist them to hit objective and stay in the game! You'd never be allowed on the hill with a stalker and .243 rifle without first demonstrating your ability to hit a target. In Scottish salmon fishing there's no basic skill test so most anglers operate on hearsay which can often be complete misinformation. Overall from what I've seen over the decades there's a definite minority of really tactically aware spin or fly fishers on the salmon rivers of Scotland who have consistent hook setting procedures or good & thorough riverbank movement techniques. To my mind those two attributes are the two most important points in salmon fishing and far more important than the aerial elegance of a fly line as a salmon is less bothered by that than you may think! Ultimately catching salmon on most salmon beats in Scotland takes patience, understanding & a consistent effort so it's always much better for everyone involved if there's a positive outcome where salmon 'take' opportunities are converted into landed salmon which keeps all parties happy including the local economy!